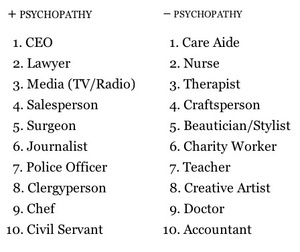 Which Professions Have The Most (And Fewest) Psychopaths? Important statistical research from Kevin Dutton’s book The Wisdom of Psychopaths: What Saints, Spies, and Serial Killers Can Teach Us About Success. Most of the professions on the right require human connection, dealing with feelings and most of them don’t offer much power. 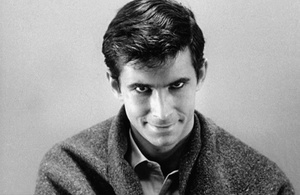 Psychopaths, by their very nature, would not be drawn to or very good at these things. On the other hand, most of the roles on the left do offer power and many require an ability to make objective, clinical decisions divorced from feelings. 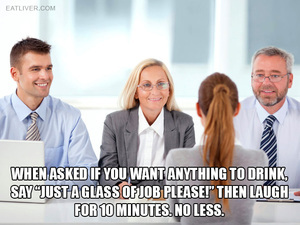 Psychopaths would be drawn to these roles and thrive there. Posted in Misc and tagged Job, power at 9:45 am on January 3, 2013 by Broadsheet.